This by no means renders reading the first book in the series unnecessary. Indeed, for readers who have not yet had the great pleasure of spending time with any of Backman’s work, Beartown and this superb sequel are a wonderful place to begin a relationship with this master storyteller. Us Against You, in a flowing translation (though the flow for American readers may be momentarily interrupted by the use of the chiefly British “gawps” rather than “gapes”) from the original Swedish by Neil Smith, makes the reader a part of the small, isolated community named Beartown, where hockey is everything, and where residents will suffer greatly before they can find any hope or salvation. Beartown is a town in agony. The residents are just beginning to see even the possibility of recovering from what they have taken to calling “the scandal.” Kevin, the star of their hockey team, raped Maya, the teenage daughter of the team’s general manager. 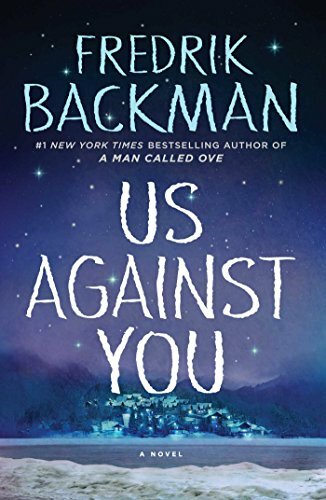 As Us Against You opens, Kevin has fled Beartown, and Maya’s family continues to feel humiliated and ostracized. Rage and violence pulsate just below the surface of everything and everyone in Beartown. When the regional council decides they will soon eliminate the Beartown hockey team in favor of focusing all their resources on the superior rival team in the nearby town of Hed so they can attract a hotel and conference center to their area, the rage and violence can no longer be contained. Backman expertly chronicles external and internal events. In brief, zigzagging sections within relatively short chapters, he presents many characters, all of them, in their individual ways, principals in this story. Backman keeps the vital interactions between these characters layered and rich without making them convoluted. Parents live in Beartown. Children live in Beartown. Best friends live in Beartown. Mortal enemies live in Beartown. Powerful and powerless people live in Beartown. People betray each other in Beartown. People save each other in Beartown. This small community deep in the forest has been fashioned by Backman into a place where we all have lived or can imagine ourselves living. He writes of hockey towns and hockey teams, and in so doing, he speaks to all of us. Heroes and villains are malleable in Beartown. The reader might at some point be rooting for a “violent gang of hooligans,” because they are the kind of people who will tell a four-year-old’s abusive parents that the parents will answer to them if the child is ever harmed again. Backman ends many chapters with a few words promising that something terrible is going to happen. Or something benevolent. The reader is warned. And still, it comes as a shock when a character the reader has come to regard as a hero does something cruel. Or when a villain commits an act of kindness. Backman teases his readers by offering images of hope and by then stating that not all of these possible successes will occur. This makes not turning the page to find out what happens to the characters virtually impossible. For readers who savor stories of relationships, redemption, and transformation, the Backman oeuvre virtually demands binge-reading. After having finished Us Against You, the reader may suspect she is not alone in hoping that this splendid series will be a trilogy. Heidi Mastrogiovanni's debut novel Lala Pettibone's Act Two, is a finalist for the 2017 Foreward Indie Book Award for Humor Fiction. Her sequel novel, Lala Pettibone: Standing Room Only, is forthcoming in 2018.